Pain in one form or another is probably the most common symptom presented to medical and healthcare professionals. Long a subject of biomedical interest, more recent biopsychosocial theories have extended the study of pain as a concept which is highly individual in the way it is experienced. Today's landscape offers a broad array of approaches to understanding pain and, crucially, to alleviating its impact. This concise and accessible volume aims to make sense of what is at first sight an eclectic mix of theoretical and practical work on pain, from a distinctly sociological perspective. While there has been much quantitative medical research on pain, in exploring sociology's important contributions to this field Elaine Denny offers insight into the world of those living with pain and the meaning it has in their lives. She provides readers with a range of explanations of pain and various influences on the experience of pain, critically analysing competing schools of thought and embedding this work in the everyday practice of providing care. The result is an illuminating volume for students of health and medical professions studying pain, the body, and the sociology of health and illness. Elaine Denny is Emeritus Professor of Health Sociology at Birmingham City University. She is co-editor of Sociology for Nurses (Polity 2016) now in its third edition. 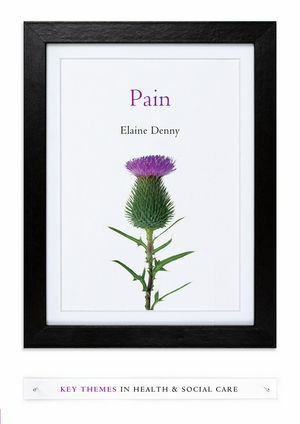 "Elaine Denny has written a lively survey of research illuminating the experience of pain with a focus on the implications for clinical practice and policy. Problematising medical assumptions of objectivity around pain assessment, diagnosis and treatment that compound the experience of pain, this accessible book offers a strong critique of current clinical practice." "Given that the topic of pain covers such a vast spectrum including culture, religion, politics, science, medicine, and the arts, amongst others, this book does an impressive job of summarising these various, often conflicting, elements, giving the reader an excellent overview of its diverse philosophies. A must-read for those with a genuine interest in learning more about the field of pain."